What can you say other than It's Florida being Florida. What I mean by that is that we've got wildlife. It lives with us, whether we want it or not. It was here first, then we came along and screwed things up. After all "Boca Raton" means Mouth Mouse in literal Spanish, just like Florida refers to the land of flowers it still is. I love the idea that all these people acting Posh live in a town named after mice, but that's just me. Watching the security cameras here, and for that matter anywhere, overnight, you spot a lot of creatures. Raccoons, Opossums, and Spiders are a daily occurrence. They belong. Then there are the introduced species. Boa Constrictors in the Everglades share space with Ball Pythons. They're clearing the place of native species while we speak. Other creatures like cats are doing damage by being out and about and emptying nests of the birds that actually belong. If you love your pet, keep them indoors or on a leash. It's common sense, and it is the law here in Wilton Manors. If it is off leash off property, it's a stray. But these toads. The Bufo Toads or Cane Toads. They're poisonous and have been known to kill a dog. They're one reason why when I let Rack out, I have a flashlight at night. We walk along the roads next to the grass since there are no sidewalks for the most part here. Shine a light at the grass to make sure there are no toads around. Rack has a very weak prey drive, but who knows when it will kick in. One lick and he's done for. It would be a trip to the e-vet after using the hose to flush out his mouth while we get him into the car, most likely convulsing. You see they sometimes hang out in the parking lots in the storm drains. They will come out at night and forage. Foraging is fine, just give them room. 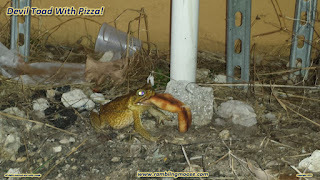 In this case, there was a crust of pizza discarded into the brush next to the building. The toad found it and tried to eat it. I say tried because it didn't seem to have any luck. I could tell you which pizza joint it is that it was eating a crust from, but I'll refrain. 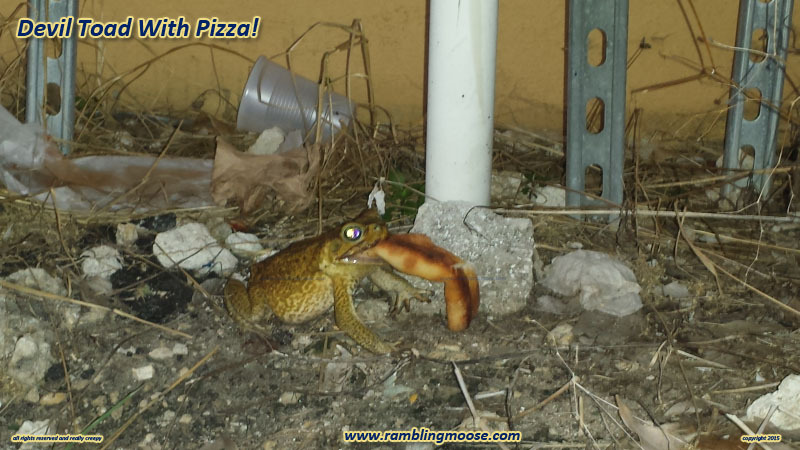 It's not often you come across a poisonous toad by the wall of a building eating a piece of pizza crust just before dawn on an October morning, but when you do, stop and take notice and think about just how weird the place is that you're at.